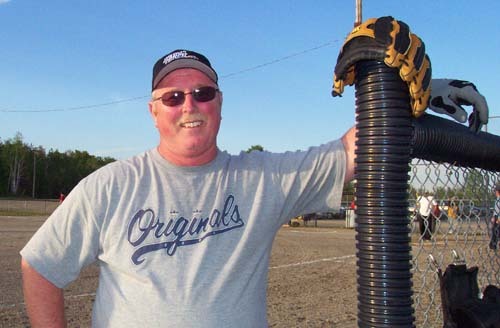 Doug Rollins, President of the Valley East Mens’ Slo Pitch League, takes a breather after running the bases during the opening game of the 2006 season. With sixteen (16) teams in action every Tuesday and Thursday night from now until the end of September, Doug and his executive are ready for anything! Doug plays on the Hanmer Home Hardware club this season. There are several new rule changes being adopted this year, but one of the ones that will be watched carefully is the ‘home run rule’. For the first time the league has adopted the “match plus one” home run limit. This rule will help keep the games a bit closer during the first half of the season when all teams play each other. Some games in the past were absolute blow-outs with stronger teams running up the score against weaker opponents because of their home-run hitters. This year, you will only be allowed to hit “one more” home run than your competition. Previously, you were limited to one home run per inning per team. Weaker teams often had difficulty hitting that single home run, while stronger teams hit one every inning. With the new rule, if your opponent doesn’t hit any home runs, you will only be able to hit one all game. On the other hand, when you have two very strong teams facing each other, instead of being allowed to hit a maximum of 14 home runs in the game, it will be theoretically possible to accumulate a total of 27 home runs between the two clubs, thus creating a slug-fest the likes of which have never been seen in Valley East. Local residents are always welcome to drop in and watch some of the action every Tuesday and Thursday evening, beginning at 6:30 p.m. Each evening there is a triple header on the two Centennial Fields behind Centennial Arena as well as a double header at the Lions Park beside the Valley East Lion’s Den. The Ladies’ League is in action on the same fields every Monday and Wednesday. Make sure you drop in for some great action and enjoy the summer with your friends and neighbours. 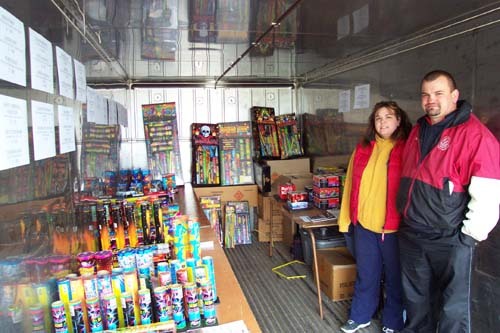 Manon and Scott Bolger stand inside the steel container at the Hanmer Valley Shopping Centre, looking over some of the fireworks on sale by the Kin Club of Valley East during the Victoria Day Weekend. The club also sells fireworks for the Canada Day celebrations. Funds generated are then distributed by the Kin Club to local Food Banks and several other organizations in need of financial support. The Kin Club operates out of the playground building in Blezard Valley where it is open Monday to Wednesday from 6:30 to 8:30 during the summer months to provide refreshments to the minor baseball players. The club house is also open whenever weekend tournaments are held at the fields. Besides being one of the most successful years every held with respect to sales of fireworks for the Victoria Day holiday, this was also one of the most disappointing for members of the Kin Club – disappointing because some unknown people, for some unknown reason chose to interfere with their efforts. Sometime between 12:30 a.m. and 5:30 a.m. on the morning of Monday, May 22, 2006 , someone cut the lock on the storage container and made off with a significant amount of fireworks which still remained inside. The culprits may have thought this was some kind of childish prank, but in reality their thoughtless action will result in some small children doing without extra food or clothing this year. The cost of the stolen supplies had to be paid for out of other sales and thus reduced the total amount of money available to be donated to those in need. Perhaps, however, this is the wake-up call to residents of Valley East and Capreol need to be pro-active when they see groups of young people roaming the streets in the early hours of the morning. Perhaps they will now call the police first and let them know about the situation so that the authorities can intervene. Perhaps, too, it will be a wake up call to parents who allow their teenage and even pre-teenage sons and daughters to stay out until all hours of the night, just asking for trouble. Our young people need discipline and direction. They also need to know that there will be serious consequences for breaking the law. There is absolutely no need to “take it easy” on a 12 or 13 year old boy or girl who is caught doing something illegal. These teenagers know full well the difference between right and wrong. They also count on the fact that most adults in the court system will take pity on them and show mercy, thus teaching them that it is all right to break the law. When the people who broke into the container and stole the fireworks from the Kin Club of Valley East are finally caught, there should be no mercy, regardless of their age. They should be forced to sit at a food bank for weeks on end, witnessing the distressed looks on the faces of young children who have to go hungry because some young punks thought it would be funny to steal fireworks. 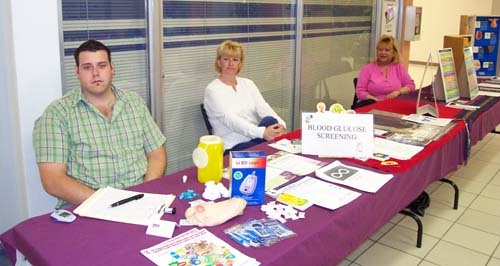 Dean Giroux (Diabetes Prevention Worker), Susan Cole (Community Wellness Worker), and Sharon Fox (Healthy Babies - Healthy Children) are shown during a special Blood Glucose Screening Clinic which was held at the Hanmer Valley Shopping Centre on May 26, 2006. The clinic is part of the public outreach program of the Ontario Metis Aboriginal Association. They were in the mall all morning doing screening for shoppers and answering specific questions about general health care. 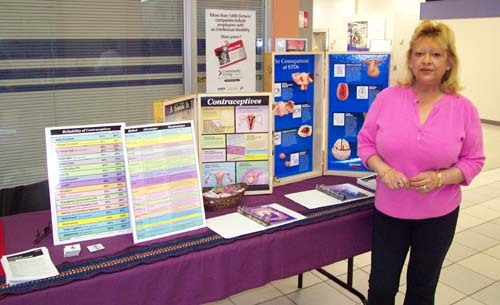 Sharon Fox is a health care professional with the Ontario Metis Aboriginal Association. She is responsible for making pre- and post-natal visits to aboriginal women and for promoting healthy choices that will lead to healthy babies and children. "I provide help to young mothers and expectant mothers on anything that a baby might need," Sharon explained. "We can provide some materials, but we mostly try to increase awareness about choices that will lead to much healthier babies. I talk a lot about Fetal Alcohol Syndrome and make sure that expectant mothers know the dangers of drinking alcohol while pregnant. We also get into parenting techniques and the effects of smoking." Sunday, June 11, 2006 at 9:30 a.m.
Julie Demore, on the left, and her friend, Kristine Lescault, are part of a group of eleven young ladies who attend post-secondary institutions in the Greater Sudbury Area. Julie is finishing her 2nd year in the Massage Therapy program at Collage Boreal, while Kristine is in her 2nd year of a Double-Minor program in French and English. 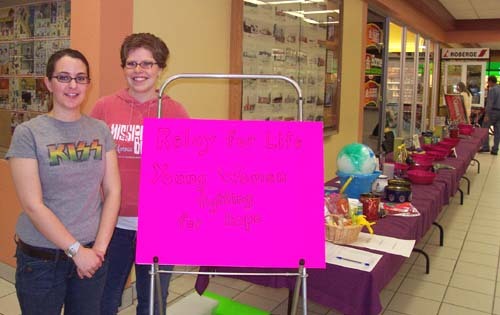 The girls, along with their friends, sponsored a fund-raising penny table and bake table sale at the Hanmer Valley Shopping Centre during the last weekend of May to raise some money in support of the Relay For Life Event which is held at Laurentian University on June 2, 2006. The Relay For Life is a 'relay' event which runs for twelve hours straight from 7 p.m. to 7 a.m., raising money for Cancer Research. "Our friend, Stephanie Hebert, who is the Captain of the team, took part in this last year and she asked us to form a team this year," Kristine explained. "We've all been touched by cancer in some way, so we thought it would be a good idea and would help us keep in contact with each other during the school year." Each girl in the group was responsible for raising $100 on their own, and they decided to run a penny table & bake table sale to add to the total. Their team goal was $4000. Krista Regaudie; Maggie Frampton; Christine Lebeau; Natalie Rochon; Melanie Roussy; Josee Valiquette; Kathryn Cossar and Elyse Gervais. The girls were grateful for the support they received over the weekend from all shoppers and expressed their appreciation to Sole Mates Family Footwear and to Bradley Pharmacy for their corporate support. The Valley East Waves are just one of the many groups and organizations that take advantage of an open invitation by the Hanmer Valley Shopping Centre to use its facilities to promote their activities and raise money through fund raisers such as car washes, penny tables, raffle sales and bake tables. There is absolutely no charge for the use of the facilities and the mall even provides tables, chairs and other material to help the groups. 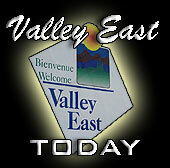 The owners of the mall, Val and Violet Mazzuca, have been strong supporters of Valley East and Capreol and will bend over backwards to help out in any way they can. Here you see Lori Leclair of the Valley East Waves supervising a car wash last summer. They will be doing the first car wash of the season at the mall on Saturday, June 3, 2006. Mr. Bernard Raymond was born in Metcalf Ontario and joined the air force at the age of 18 and was stationed on different bases until he reached the Radar Base in Hanmer, this is how he met Leonne Proulx who was born and raised in Hanmer. Mr. Raymond then left the Air Force and wed Leonne and got hired with Inco. A few years later he left Inco and became and Iron Worker were he worked for many years until he became ill, and retired at an early age. Leonne Proulx Raymond started working at a very young age, she would help her mother Florestine teach school. She graduated High School at a very young age and went on to Business College. After college she worked for the Bank of Montreal and Toronto Dominion Bank then she was hired as the first bank teller for the Royal Bank in the Hanmer Mall. She worked there for over twenty years and was very well respected by her customers. She was forced to take an early retirement due to illness. Leonne Proulx Raymond died of cancer on June 16, 1984 at the young age of 49, and Bernard Raymond died of a heart attack on March 29, 1987 also at the young age of 48. 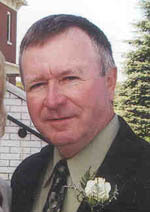 They have two children Monique Raymond Grenon ( husband Daniel) of Hanmer and Carole Raymond Nadeau ( husband Carl) of Val Caron. Carole has followed in her mothers footsteps and has been working for the Royal Bank for twenty years. The Ontario Health Promotion Minister Jim Watson is touring the province of Ontario promoting the province wide clean-air bylaw, which takes effect at midnight Wednesday, May 31, 2006 . Smoking will be banned from all public places, including outdoor patios with roofs. In addition, before selling cigarettes to anyone who looks 25 and younger, store owners must ask for proof that buyers are at least 18 years old. The public seems to have accepted the idea of a smoking ban from public places, while there is a small minority that is still fighting the idea. It appears to be a losing cause. Even homeowners can be found standing outside their house smoking as spouses agree that second-hand smoke is bad for children. With the summer months upon us, we are hearing of a number of frightening home invasions. Recently two men tried to forcibly enter a Valley East home with shotguns. The homeowner was able to push them out the door and call police. About 20% of all homes are now equipped with security detection systems, but security companies indicate that many people do not turn them on during the night while they are asleep. Police warn residents that if they do confront a home-invader, the best thing to do is simply comply with their wishes. Do not try to fight them. The cost of home alarm systems range from $400 to $3000. Starting with the 2007-08 academic year, athletic financial awards will be available for Ontario University Athletics student-athletes. This is great news for Universities who have been competing with American schools for top athletes seeking scholarships. The award is eligible to those student-athletes entering with an average of 80 per cent or better. Under the current system, Ontario universities can only offer returning student-athletes with a 70 per cent average a combination of scholarships and bursaries worth as much as $3,500 a year, but are unable to offer entering first-year athletes any sort of incentive. Now, first-year students, too, can receive up to $3,500 annually. For students attending Laurentian University, this means that a student-athlete who qualifies will receive a total of $5000 towards his/her studies. Laurentian already automatically offers students entering with an 80 percent average a $1500 scholarship. This is good news for local student-athletes who can now live at home while developing their skills in their favourite sport at the University level. It means that many will be able to concentrate on academics and sports without the need to work part-time. A plan to combat childhood obesity, proposed by the Mayor and Council’s Children First Roundtable was approved recently by the city’s priorities committee. The Sudbury and District Obesity Action Plan outlines ways to work with school boards, Ministry of Education, province, city, employers and parents to encourage exercise and good nutrition. However, many local residents are stating that if the City had better playground facilities throughout the region, this would be a far better way of fighting obesity than wasting time on a report. Greater Sudbury 's Official Plan will establish goals, objectives and policies that will direct land use decisions at city hall for the next 20 years. The plan was approved at a special meeting of the planning committee on Monday, May 15, 2006 and City Council approved the submission of the plan with a couple of minor changes to the agricultural land use section. Ward 3 Councillor Andre Rivest wanted to upgrade the Barrydowne Extension from long-term to short-term, but Council rejected his request, claiming that Council could change the designations at any time if they felt demand warranted it. The plan must now go to the province for approval and/or amendments. In a news release from the Department of Infrastructure & Emergency Services, Greater Sudbury Emergency Medical Services (EMS) reminds residents that backyard swimming pools, including inflatable models, pose a safety hazard that could lead to tragedy. It is a City of Greater Sudbury bylaw that privately owned outdoor swimming pools with a capacity of more than 24 inches (61 cm) of water must be enclosed to render the pool area inaccessible to small children, whether or not a fence already exists. "Drowning is the second leading cause of accidental death in children under five," said Joseph Nicholls, Chief of Emergency Medical Services. "Never leave your children alone in or near a pool, even for a moment. Make sure your pool is surrounded by a proper enclosure. Most accidents occur when young children wander out of the house and fall into a pool. An ounce of prevention can prevent a lifetime of sorrow." Privately owned outdoor swimming pools capable of holding more than 24 inches (61 cm) of water cannot be filled unless a Pool Enclosure Permit has been approved and issued by the City of Greater Sudbury . Swimming pool gates and enclosures, including decks, must follow specifications contained in the municipal bylaw and the Ontario Building Code. For more information, please call 671-CITY (2489) or visit www.greatersudbury.ca. Residents from across Greater Sudbury are being called upon to participate in the Community Solutions Team public input sessions. The Greater Sudbury City Council established a Community Solutions Team to engage citizens on issues raised by residents and businesses in the city's outlying areas. The seven-member team of volunteers– headed up by former Nickel Belt MPP, Ontario Minister of Finance and Deputy Premier Floyd Laughren– will launch a series of public meetings in 20 communities across the city in an effort to clarify the issues and identify potential solutions. Meetings will be held at the Capreol Arena on June 8 at 7 p.m.; at the Centennial Arena on June 11 at 7 p.m.; at the Ray Plourde Arena on June 19 at 7 p.m.; and at the Rheal Belisle Centre in Blezard Valley on June 29 at 5 p.m. The "Deliverance At Hand!" Conventions of Jehovah's Witnesses will be held across the world during 2006 - 2007. All sessions are open to the public and there are never any fees or collections taken. The Northern Ontario congregations have invited everyone to attend the three-day convention which will be held at the Sudbury Arena from June 9 to June 11, 2006. This is one of 36 such conventions to be held across Canada and expect a record number to be in attendance in Sudbury. For more information, contact Harry Nelson at (705) 673-8685. When my Father-in-law, Ignace Starcevic, passed away in 1982, my wife asked me to come up with something nice to have engraved on his tombstone. I was only 32 at the time and we were in the process of raising three young sons, aged 3, 5 and 7. It was a hectic time of our lives and we were typical parents – running ourselves ragged as we encountered all of the normal experiences and challenges faced by all other young parents. Last fall, when my Mother-in-law, Helen Starcevic, died, we found ourselves in a completely different set of circumstances. The other day, as I was making arrangements with Ellero to have the tombstone engraved with the date of her death, I took a long look at the inscription I had selected 24 years ago and it seemed as if time had stood still. I paused to ask myself where those 24 years had gone, and moreover, what had changed in my life? My wife and I are still living a hectic life; probably more hectic and busy than we’ve ever been. True; our once young sons are now 27, 29 and 31, each with lives of their own to live. My oldest is almost the same age as I was at the time of the death of his grandfather. As I look at him and his wife, I see myself 24 years ago. They are typical parents – running themselves ragged as they encounter the change of life that comes from having two young daughters, one aged 3 months and the other turning 2 years old this summer. I remember when I was my son’s age and remembered how I thought of myself as young, energetic and still with a full life ahead of me. I could handle the world and anything that came along. I was invincible, and yet I was also a bit frightened about what the future would hold. I recall that when choosing the inscription for my Father-in-law’s tombstone, even back then it struck me as a very profound statement. And yet, with the passing of time I realize that I am only now beginning to appreciate and understand the significance of its meaning. As a 32 year old, it was impossible to fully comprehend its message. The inscription I selected is: DEATH IS NOT THE ENEMY OF LIFE, BUT ITS FRIEND. FOR IT IS THE KNOWLEDGE THAT OUR YEARS ARE LIMITED WHICH MAKES THEM SO PRECIOUS. 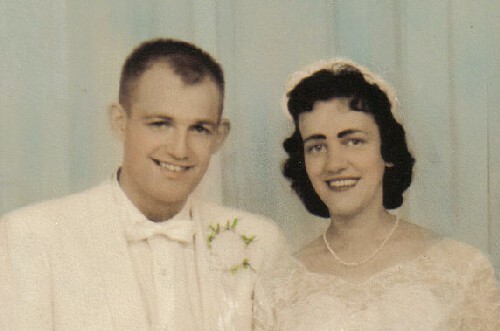 My wife and I look at our situation today and other than the fact that we have aged a bit, nothing much has changed. Our life is still hectic. We spend every possible moment we can with our two granddaughters. It seems as if we are always going somewhere or doing something, and we seldom have time to simply put up our feet and rest. And yet, even though I am just as “busy” as ever and still trying to “get it all in”, I feel much more relaxed than I was 24 years ago. I think it is because for the past 24 years I was simply “accumulating” experiences in an effort to define who I was and while I was doing that I was too focused on the responsibilities of being a husband and father to take time to appreciate those experiences. Now, while I think I am in many ways doing much more with my life than I ever have, I don’t feel as rushed or pressured. When my granddaughter wants me to sit down with her to read a book, I stop what I am doing and get down on the floor with her. All of a sudden, deadlines, dinner, cutting the grass, and appointments don’t seem quite as important as they once were. And yet, when I eat dinner, cut the grass, meet with people, write these editorials – indeed, when I do anything now, I enjoy the experience much more than ever before. I have discovered that “taking time to smell the roses” doesn’t mean that you have to “slow down” or “miss out on anything”, it just means that you have learned that you can actually “enjoy what you are doing” and still get the most out of your many experiences. The biggest difference from 24 years ago – I know that my years are limited. I know that I am not invincible. And I do feel that each and every day is a wonderful, precious gift. If only I had realized that 24 years ago.